Beyond The Stoop - Life in Jersey City: happy friday! wait... it's the weekend already? i feel like this week flew by so fast. no? you've been waiting for friday since monday? maybe it's the fact that there's a holiday weekend coming up!? also, that frame? it's mine. or, more accurately, it "will" be mine soon. my mom has a knack for finding the good stuff.... the good stuff that sells for way-out-of-our-price-range prices in new jersey that sells for pennies in ohio. 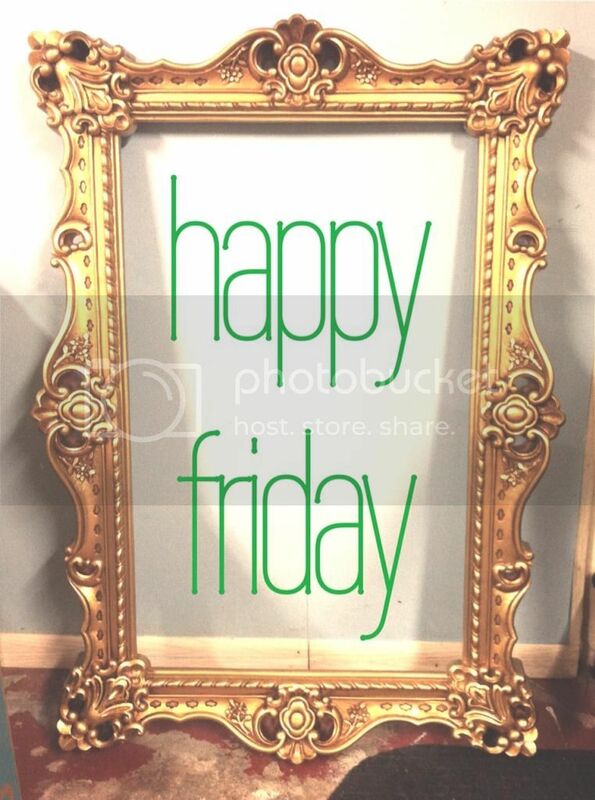 the frame came with a mirror, but she took it out with intentions of painting the frame to sell a trendy colorful mirror before i stopped her in her tracks and said that i wanted it exactly the way it was. i'm a sucker for that gawdy gold stuff. hung had the idea of "giving me a vanity area" in the bedroom that i was just "meh" about when he first brought it up. but the more i think about it, the more awesome it sounds. i mean, we plan to stay in our 2-bedroom apartment through 2 kids, which means 4 people and 1 bathroom, which means eventually the bathroom will be for bathroom duties only. putting on make-up and blow-drying my hair are not bathroom duties. plus, he's right, i do enjoy sitting down while putting on my make-up anyways (you can find me sitting on the floor in the living room in front of the mirror most days anyways). now i just need to find a desk that will fit in that little full-of-natural-light nook in the bedroom. i'll be perusing craigslist and local reclaimed/vintage/repurposed furniture shops (like L.O.V.E. furniture in east hanover NJ) and i'm sure i'll find "the one". we found our double drop-leaf, gate-leg dining table at miss pixie's in DC, so we'll be sure to stop in there next time we're in the area too. brooklyn flea in, well, brooklyn? the frayed knot in hoboken? now i just need a weekend to actually GO to these places!! cheers! happy labor day weekend!